Almost a thousand extrasolar planets have been discovered in the past few decades, with masses and orbits that are different from those in our solar system. Extrasolar planets have been found in great diversity from lunar-sized planets around pulsars to massive gas giant planets around Sun-like stars. Our group is deeply interested in understanding how the planet formation process results in such a diversity of planets. On this page we summarise some of the research projects that we are currently working on. The evolution of planetesimals, the building blocks of planets, is dominated by collisions with other planetesimals. The outcome of these collisions depends on impact angle, spin, target to projectile mass ratio, and impact speed. In order to determine the effects of these various collision parameters, I have completed several parameter-space studies of collisions, which show that weak aggregate bodies are easily disrupted due to efﬁcient momentum coupling during low-velocity collisions. This means that the collisional growth of planetesimals requires a dynamically cold environment; alternatively, a non-collisional mechanism could be required to form planetesimals large enough to be resistant to collisional disruption (several tens of kilometers). One of the biggest problems in understanding planet formation of Earth-like planets is how to keep the orbits of the planets close to circular. One hypothesis is that collisions between planetesimals produce enough debris that the larger protoplanets are dragged into circular orbits. 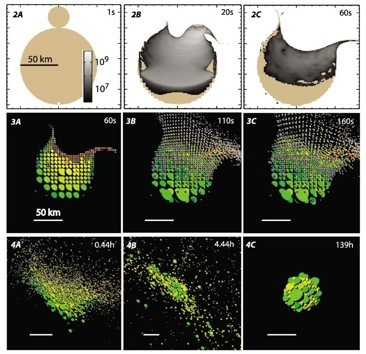 In order to test this idea I have developed a self-consistent planetesimal collision model that includes fragmentation and accretion of debris. This model allows more realistic simulations of the evolution of protoplanetary discs to be performed. I performed a series of numerical simulations with a variety of initial conditions. I found that it was not possible to produce the debris needed to damp the larger objects by planetesimal collisions. In addition, the number, masses, and time required to grow a protoplanet, depends strongly on the initial conditions of the disk.